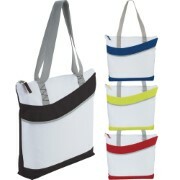 Fresh budget zippered tote style for tradeshows, conventions and business meetings features sporty styling. Supplied with business card stitched on bag. Available in 4 colours. We would love to help you with a custom quote. Mention NOTTAGE-5065BK. Just call 1800 674 722 or get a custom quote.